Whether you’re a seasoned market researcher or not, you’ll come across a lot of statistical analysis methods during your project. Check out the most popular types and how they work. This is a statistical technique used for working out the relationship between two (or more) variables. A change in a dependent variable depends on, and is associated with, a change in one (or more) independent variables. Linear regression uses a single independent variable to predict an outcome of the dependent variable. Multiple regression uses at least two independent variables. The resulting graph from a regression analysis shows a ‘regression curve’ that shows the impact on footfall as money spent on publicity increases or decreases: data is rarely directly proportional, so there’s usually some degree of curve. This is a useful test as you’re able to identify the precise impact of a change in your independent variable – in this case money spent on public relations or marketing. This is used with a regression study to find out what effect independent variables have on the dependent variable. It can compare multiple groups simultaneously to see if there is a relationship between them, e.g. studying whether different types of advertisements get different consumer responses. FIND OUT MORE: What is Analysis of Variance (ANOVA)? Market researchers love to understand and predict why people make the complex choices they do. Conjoint analysis comes closest to doing this: it asks people to make trade-offs when making decisions, just as they do in the real world, then analyses the results to give the most popular outcome. What does customer’s partner feel? -It’s OK It’s OK Loves it! There are lots of possible combinations of answers – 54 in this case: (3 restaurant types) x (3 price levels) x (3 distances) x (2 partner preferences). Once the survey data is in, conjoint analysis software processes it to figure out how important each option is in driving customer decisions, which levels for each option are preferred, and by how much. So, from conjoint analysis, the restaurant investor may discover that there’s a preference for an expensive Spanish tapas bar on the outskirts of town – something they may not have considered before. This helps you compare whether two data groups have different mean values, e.g. do women and men have different mean heights? The t-test allows the user to interpret whether differences are meaningful or merely coincidental. This is used in quantitative market research to analyze categorical data – that is, variables that are different and mutually exclusive, such as: ‘men’ and ‘women’, or ‘under 30’ and ‘over 30’. It allows you to compare the relationship between two variables in contingency tables. Our Stats iQ product can perform the most complicated statistical tests at the click of a button using Qualtrics online survey software, or data brought in from other sources. 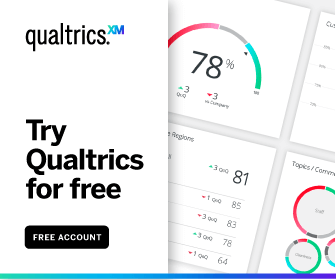 Turn your data into insights and actions with Qualtrics Research Core and statistical analysis powered by iQ.